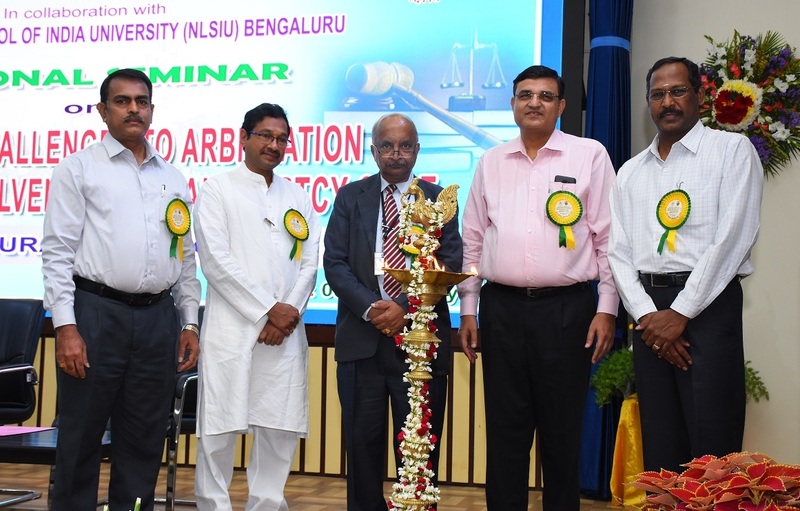 A one-day National seminar on “Trends and Challenges to Arbitration in the light of Insolvency and Bankruptcy code” has been conducted by NLC INDIA Limited in collaboration with National Law School of India University Bengaluru on 9th February 2019 at Learning & Development centre, of NLC INDIA Limited , Neyveli. The Inaugural function has been presided over by Shri Rakesh Kumar, CMD NLC INDIA Limited, and Honourable Justice MM Sundaresh, Judge Madras High Court was the Chief guest and Prof R Venkata Rao, Vice Chancellor, NLSIU, Bengaluru has been invited as Guest of Honour. During the Inaugural Function, Justice Sundaresh called Public sector undertakings to go for the institutional arbitration mode to settle the contractual disputes to meet the timelines, and also highlighted the need for the Arbitrators to be fair, impartial and to have a sense of responsibility with respect to adhering to the time lines. While delivering the presidential address Sri Rakesh Kumar, CMD NLC INDIA Limited said that, since the commercial interest of the corporates is involved in the Arbitration Proceedings, which will have an impact on the society at large, he called for adhering to the timelines for conclusion of the proceedings in time. Professor R Venkata Rao, the guest of honour has taken the participants through the journey of IBC and said that, knowledge is the power and that everyone has to acquire the knowledge in their respective spheres and one should not ignore the same. In the daylong Seminar Three technical sessions has been conducted on various issues related to the Arbitration Contracts and IBC Code. First Technical Session has been Chaired by Justice MM Sundaresh, with the Co panellist ,Prof V. Nagaraj, NLSIU Bengaluru, Second Technical Session was chaired by Sri T K Viswanathan, former Union Law secretary, Government of India and the former Secretary General of Lok Sabha, with the co panellist Shri GP Madaan, Founder & Partner, Madaan Law offices and Co-Chairman, National Council for Mergers & Acquisition of ASSOCHAM, and Third Technical Session has been Chaired by Honourable Justice G R Swaminathan , Judge Madras High Court, and Sri GM Rama Murthy, Executive Director (Retd) IDBI, being the co panellist. While Prof Nagaraj has explained about the history & current scenario of Arbitration in India, Sri GP Madaan taken the participants through the basic concept and understanding of IBC Code. Sri G M Rama Murthy has explained about the nuances of contract and arbitration issues. Sri TK Viswanathan explained about the stress and strain while drafting any law taken by the concerned and expressed his concern that, in the modern days’ no one is trying to go through the documents related to law thoroughly and carefully, instead searching for some information out of the whole document. He further said that, the concerned who drafts the law will not have the freedom as poets and writers to use the words which are attractive and to be appreciated, but to draft them within the prescribed timelines and that too, by using the appropriate language only. Honourable Justice GR Swaminathan, Judge Madras High Court was the Chief Guest for the Valedictory Function presided over by Sri Rakesh Kumar , CMD NLC India Limited. Justice Swaminathan, explained the concept of Liquidated Damages under the Contract Act, and advised the young law students from Tamilnadu National Law university Trichy, Dr Ambedkar Law College, Chennai and VIT College of Law, Chennai who were present in the seminar to involve themselves in reading the books and articles written by the learned senior judges thoroughly to gain more knowledge. Sri R. Vikraman, Director – Human Resources, Sri NNM Rao, Director Planning & Projects , Sri Venkata Subramanian , Chief Vigilance Officer, NLC INDIA Limited graced the function with their presence. All the senior executives of the NLC India Limited and delegates from various public sector companies like BHEL, TNPL have attended the seminar apart from the delegates from NLC India Limited. Sri V Rajeevan , DGM/Legal has explained the programme perspective while welcoming the delegates, and Sri DVSN Murthy , DGM/Legal has summed up the Technical sessions of the seminar during the valedictory function. The Seminar concluded with playing of National Anthem.